Posted May 6, 2014 by Sue Peffer & filed under News. Cambridge, UK – 6th May 2014 – Cresset, innovative provider of computational chemistry software and services, announces the release of Blaze V10.2. This version of our unique virtual screening software contains major enhancements to the workflow that improves results and reduces the search time, a new REST interface to enable enhanced integration with third party software and an improved security system. In addition, computational chemists will benefit from free access to a new, fully-functional Blaze Cloud demo server that demonstrates the simplicity of a Blaze virtual screening experiment. 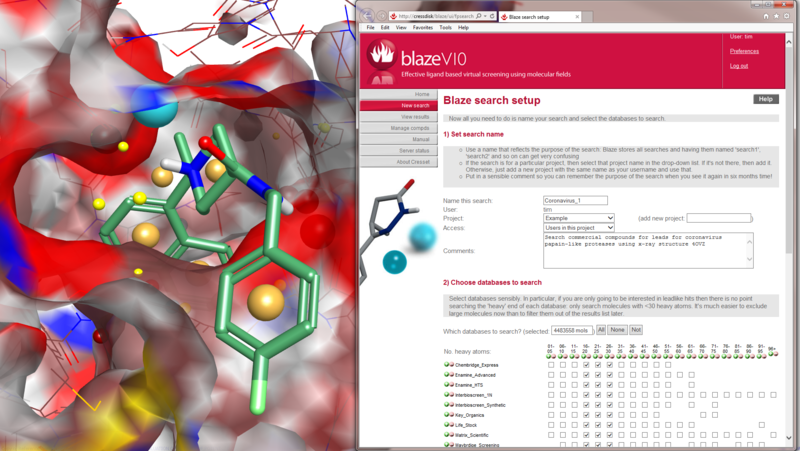 Blaze SaaS, provides the ability to search millions of commercially available compounds using an encrypted web browser session. A new search algorithm that enables full 3D assessment of molecules at four times the speed, enabling the processing of larger databases of over 10 million compounds. A new RESTful web service providing easy integration with Forge, KNIME and Pipeline Pilot and custom software solutions. Simplified security features that are easier to unify with corporate policies, in response to customer requests. This makes it easier to roll out Blaze across corporations. A free demo server, enabling you to search a small collection of compounds using the standard search cascades and manage compound collections. Register for your username and password at the Blaze demo signup page. Read more about the new release of Blaze V10.2.